Cucumber And Mango Salsa Recipe recipe by Sabiha at PakiRecipes.com. Mango peeled and chopped 1 No. Fresh cilantro chopped 2 Tbsp. Jalapeno peppers, seeded 1 No chopped finely. Fresh lime juice 2 Tbsp. 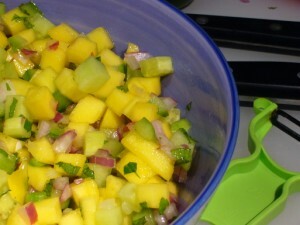 In a bowl combine mango , cucumber, onion , cilantro, Jalapeno pepper and lime juice. Salsa is ready to enjoy!!! !.